I cannot believe that 2018 is upon us! This is the first year that I have honestly felt that the house is really starting to feel like a home and reflects more of our personal stamp. Of course, its all of the readers who support us and comment that spur us on to try to stretch our creativity with new projects and ideas. We could never do any of this without the blog. I just hope that you also get some out of it in terms of learning from our mistakes and successes as well as inspired to think outside the standard. I am so thankful for you! 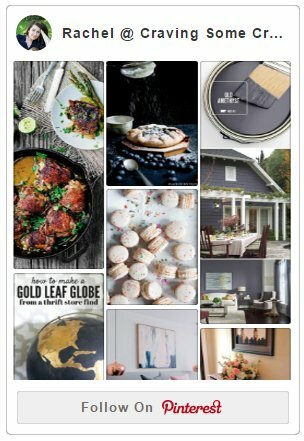 As a recap of this year, I thought I’d share my top 10 Project Posts. I put them in chronological order so they aren’t ranked and it would be really hard to do that! So I hope you have a bit of fun looking back with us through all of the things we can mark as DONE, DONE, DONE this year! Modern Stair Railings Makeover – Although this project was actually completed very late in 2015, the floors themselves didn’t get completely finished until February. It would have added thousands of dollars to our flooring project to redo the railings on both staircases. Two $25 quarts of paint was the very best budget option and adds a modern sophistication to them with the contrast of the white and black. Also, best rock hard paint ever! 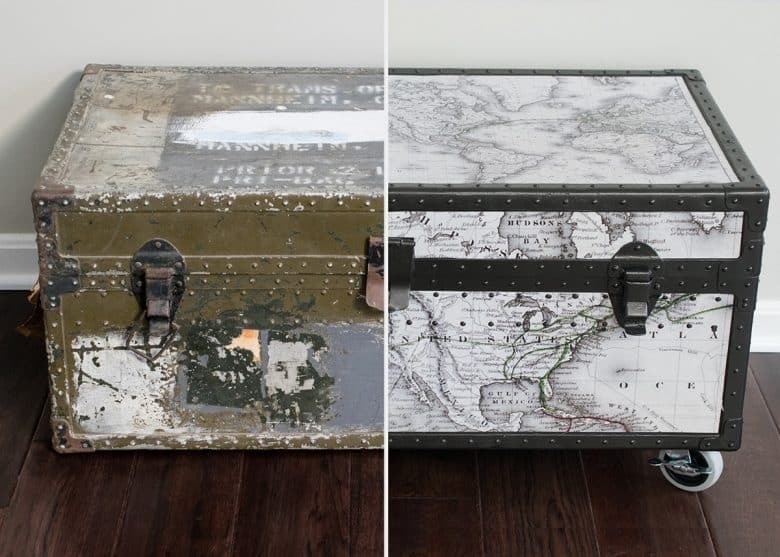 Antique Trunk Makeover – This poor Korean War Era military trunk definitely had battle scars – and more than 4 different kinds of paint and rust on it. But the after even surprised me as to how good it turned out. 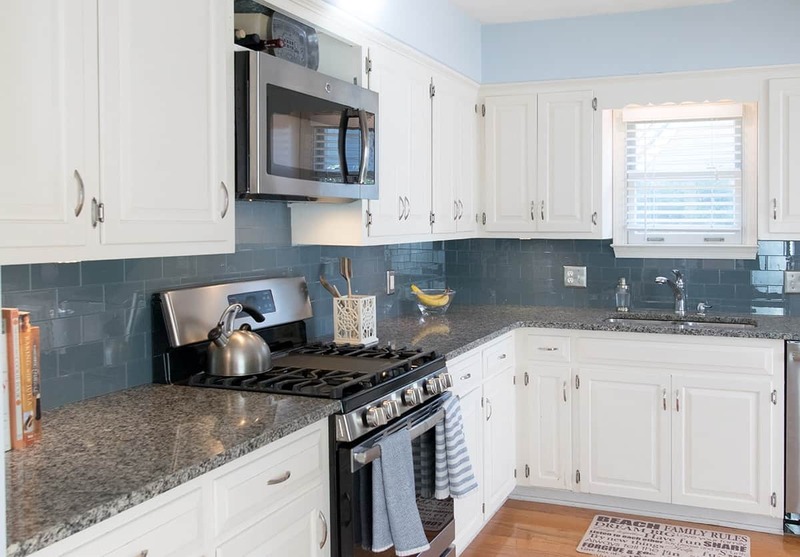 Peel and Stick Glass Backsplash – Although our kitchen isn’t even finished, we gave some help to our family in installing these peel and stick glass backsplash tiles for their kitchen. Even I was skeptical about a peel and stick backsplash but it has held up beautifully and they say it’s been easy to clean as well. Full Garage Makeover – Just as spring was starting, we got a very big itch to complete an outdoor project and were blessed with the opportunity to finally do something about the garage floor. With only paint and a lot of spackle, we completely changed the garage into a workshop with finished walls and a non-slip, beautiful floor that I love. A Casual Party with less than 2 hours prep – Although I normally create crafty dessert tables with all the little details, I was pretty proud to make this party happen with only 2 hours prep including shopping. 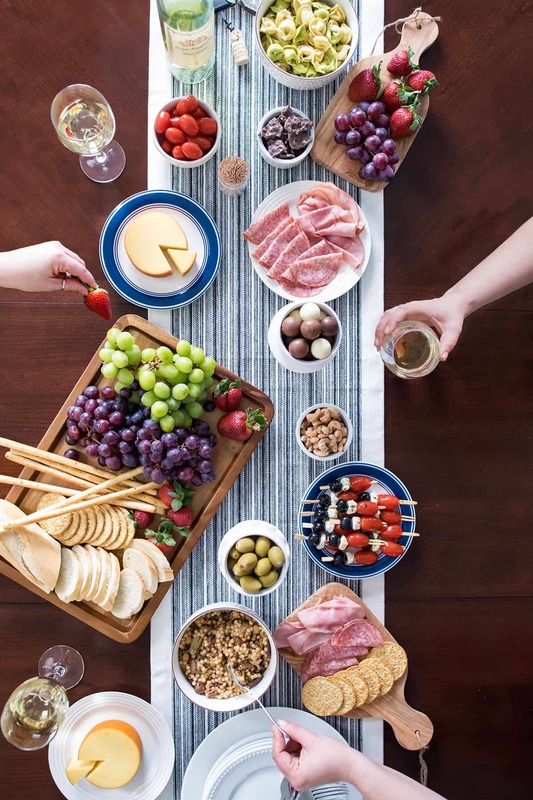 While it might not be a a huge DIY project, it was a pretty fun challenge to do this wine and cheese party. 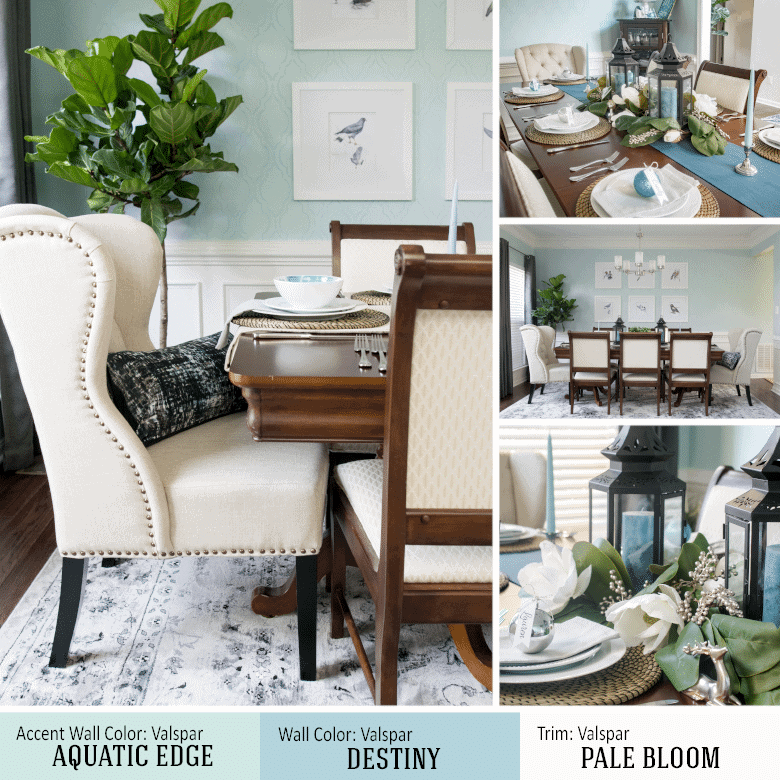 Traditional Eclectic Dining Room Reveal – We participated in the One Room Challenge for the second time and survived! The dining room turned out exactly as I envisioned even though it wasn’t until our Christmas Home Tour that I finally found the exact centerpiece I wanted. Stylish Kid’s Closet Makeover and Book Storage – I am so blessed to have an avid reader in the family. The pile of books covering the floors, not so much. So we built this closet with a clever IKEA hack and made it fun so our son could actually have a usable closet with storage for his books and even a cozy place to hide out and read if he wants. Powder Room Makeover – During the summer, I was so excited to tackle the cheesy yellow bathroom. I will forever remember the horror that struck my face when I first painted it yellow. What was I thinking?! But with simple DIY wainscoting and paint, the entire bathroom looks completely different. Someday, I might change the blue to a really deep contrasting color, but I think it is amazing now. Cerused Table Makeover – My sweet neighbor brought me this lovely roadside find – although it wasn’t lovely when it started out. I had always wanted to try a cerusing technique and the table turned out gorgeous. I was also able to sell my first furniture flip with it this fall! Guest Bathroom Renovation Reveal – This is probably the highlight of our year in terms of projects. 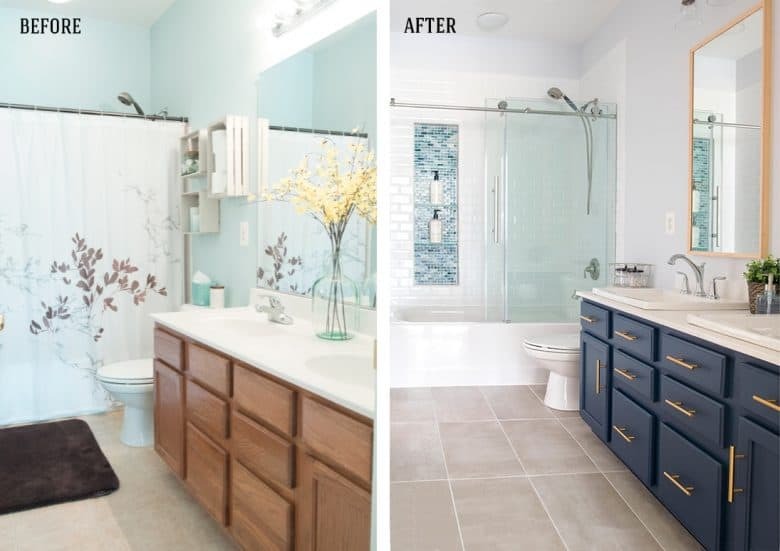 I shared our renovation start to finish along with so many tips including painting a vanity, working with beveled tile, and the worst way to ever design a shower niche (although I looooooove it!). So that’s our DIY year in a nutshell. Whew, that was a ton, wasn’t it? I want to thank all of you from the bottom of my heart for following along on our journey in this house and I can’t wait to see what 2018 has in store. Do you have a favorite project of ours this year? Or a project in your own home that you were so proud to accomplish? I’d love to hear about it!